New Delhi : A combative government today accused the Congress-led opposition of running away from debate after they stalled Rajya Sabha demanding resignations of External Affairs Minister Sushma Swaraj and two BJP chief ministers over Lalit Modi controversy and Vyapam scam. Opposition parties rejected the government offer of a statement by Swaraj, who is accused of helping Lalit Modi in getting the UK travel documents, and a debate "in any format, at any time", saying she must resign first. Their refusal of government's offer prompted Finance Minister Arun Jaitley to say they were interested in disturbance not debate. Telecom Minister Ravi Shankar Prasad attacked Congress over its demand that Rajasthan and Madhya Pradesh chief ministers Vasundhara Raje and Shivraj Singh Chouhan quit, saying if discussion on state issues is allowed, then Robert Vadra's land deal and CBI's probe against Himachal Pradesh Chief Minister Virbhadra Singh could also be discussed. On demand for discussion of Vyapam scam, in which Congress is targeting Chouhan and Raje's alleged help to Lalit Modi, BJP said state issues cannot be discussed in Parliament. 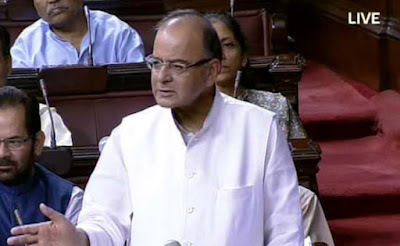 Jaitley, who is Leader of the Rajya Sabha, said government offered that the issue can be discussed in the House with Swaraj making a statement on it, but the opposition rejected it. "We get a distinct and clear impression that the opposition wants disturbance for some time. They don't want a discussion. The government is publicly declaring, as we have in the House, that we are ready for a discussion in any format, at any time," he told reporters after Rajya Sabha was adjourned repeatedly over the issue. "We offered that Sushma Swaraj could reply to the discussion. Other central ministers if necessary will also reply to the discussion and in case they want her to make a statement, we can even start with her making a statement and the discussion could be structured around her statement. We left the option to the opposition which has not been accepted by them," he said. On the Congress demand that issues involving Raje and Chouhan be discussed, he said there had not been a single precedent in the history of Parliament when state issues were discussed. "That's the part of federal politics of India." Prasad said Congress cannot be selective about raising state issues and added that all parties could decide by consensus to break the parliamentary tradition of not discussing state issues in Parliament. If debate on state issues is allowed, then there could also be discussions on scams in Karnataka, Kerala, Assam, Uttarakhand and Himachal Pradesh; all ruled by Congress, Prasad said.